CBC launched Live Right Now on January 1, 2011 to inspire Canadians to join together and change the health of this country. The initiative is built around the idea that we can have a big impact by making small changes to the way we move and how we eat. Their latest initiative, in partnership with the David Suzuki Foundation, is to encourage Canadians to commit to spending 30 minutes in nature each day for 30 days in order to increase health and ward of the negative effects of nature deficit. Needless to say, this was right up my alley! However, they needed an online video, and they needed it fast; from pitch, to script, to storyboard, to production, and available online in less than a week … a personal record for me. The idea was to have various CBC and Live Right Now personalities deliver parts of a script detailing the project and how they were going to get involved. Of course, the video had to have a “nature” feel to it… not so easy in the heart of downtown Toronto. I think we pushed the limits of the pocket park adjacent to the CBC building pretty well and I was happy with the different looks we got out of a few trees, some green grass, and yet-to-bloom plants (remember this was only April as you can tell by the visible breath on some of the talent). The early morning weather played nicely with my available light shooting style, which meshed well with the natural theme. 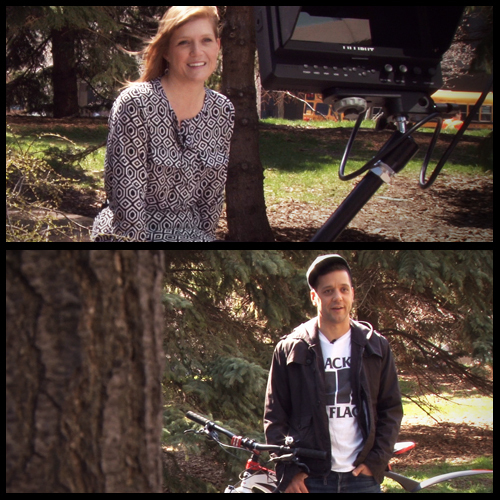 We started early with a two-camera set up and minimal crew (only Nikki, a CBC producer, and a volunteer grip). Sound is always an issue in such a busy session but I made sure to include some of the busy background in the establishing shots so it didn’t seem out of place and, since the message of the campaign is to just get outside where and when you can, I thought it amplified the David Suzuki message. We managed to stick to our 30 minute per person schedule. Thank goodness as Mother Nature only cooperated until noon and then a storm moved in just as we wrapped. All in all it was great to provide an online video production for such a worthy cause and I really enjoyed the chance to work with the CBC celebs and behind-the-scenes folks. I look forward to future projects with Live Right Now and the David Suzuki Foundation this summer!